Is your website up to date? Maybe you’re not sure, but that’s okay! Our job is to make sure business websites (ours and our clients’) stay on the cutting edge so they continue to function efficiently and effectively year after year. More websites exist today than ever before, so if you’re not keeping up with the latest trends, you’re falling behind your competition. 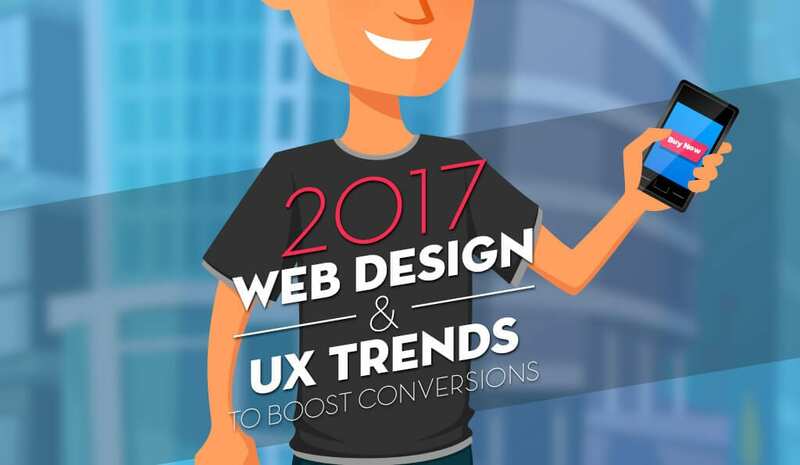 Now is the time to think about next year, so we’ve compiled a list of predicted web design trends for 2017! You probably know that responsive web design, the ability for a website to automatically adapt to different screen sizes on different devices, has been the trend for years now. With new technology coming out every year, this is only expected to grow. In 2017, we should expect to see age-responsive design, where content will adapt to specific users based on their age and proficiency. Navigation menus, font sizes, and color schemes will adjust according to the competency of the user. Videos are becoming increasingly popular for websites, likely due to the increase in internet speed and wider accessibility for users. Many people also prefer to learn by watching video as opposed to reading a lot of content. According to Hyperfine Media, 96% of B2B organizations are already using video in some capacity in their marketing campaigns, and 87% of online marketers use video content. Your website home page should have a clear, concise message that tells who you are and what you do in a matter of seconds. This should be the first thing a visitor sees on your site. If visitors can’t determine what you can do for them quickly after they land on your website, they’re likely to leave and never return. Capture their attention instantly with a meaningful message. Your website should tell your unique story using a combination of text and visuals. Storytelling has been a popular web design trend for a few years now, and it still holds great value. Show visitors who you are, where you came from, what you have to offer, or anything else you want them to know through video, animation, or photography, or lead them through your web page or website by getting them to scroll down or click somewhere. In order for your story to be portrayed successfully, it needs to be carefully and skillfully thought out and implemented. Forget the stock photos! Get out the camera and take your own photos, or hire a professional photographer to take photos for your website. Cheesy stock imagery can project an unauthentic vibe, which you don’t want on your business website. You want your website to help you build trust with your visitors. Be original and relatable by integrating fun illustrations, bold typography, animations, and authentic-looking photography. The microinteraction trend was huge in 2015. A microinteraction, according to microinteractions.com, is a contained product moment that revolves around a single task. Examples include setting an alarm, choosing a password, Liking something on Facebook, etc. In 2017, we as users are expected to engage in thousands of micro-mini interactions. Micro-mini interactions are basically microinteractions broken down into steps. If an example of a microinteraction is setting up a new password, a micro-mini interaction would be typing your password into your computer. Another would be retyping it to confirm, and another would be clicking the submit button to set it. Web designers and programmers will have to pay close attention to even the smallest details when building websites in order to make micro and micro-mini interactions as intuitive and effortless as possible. Content management systems like WordPress are becoming more advanced, customizable, and popular. They make it easy to add or edit content and keep your website up to date at all times. With the rapid evolution of the online world, it’s important to stay up to date on the latest web design trends. If you need help updating your website or building a brand new website from scratch, contact Blue Frog Marketing. Based in Des Moines, Iowa, we serve customers across the U.S.